Oh yes, it’s that time of year. The holidays are crazy, basketball season is here, and we had to fit in a Disney Palace Pets Party this past weekend. 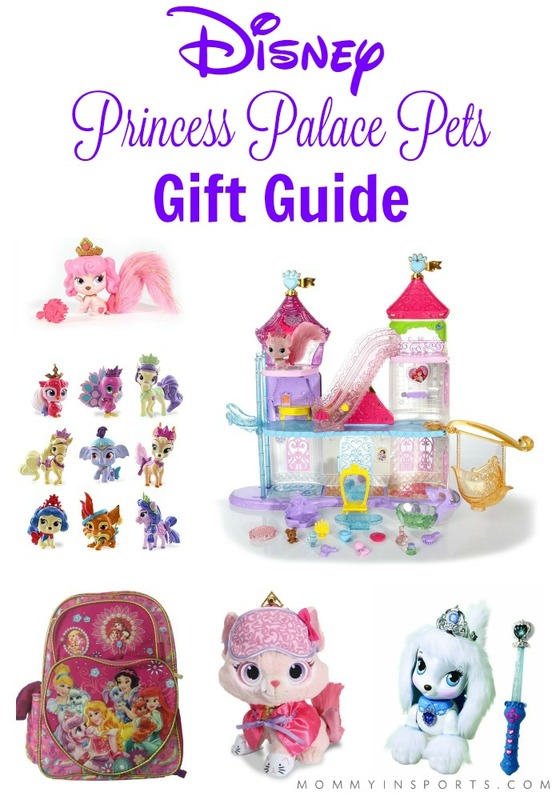 Our littlest is turning four soon, not a baby anymore (sniff, sniff), and is obsessed with Palace Pets. But when I perused Pinterest, there were very few ideas, so I was left up to my own imagination to create something special. As most of you know, I love to bake, but am by no means a professional. 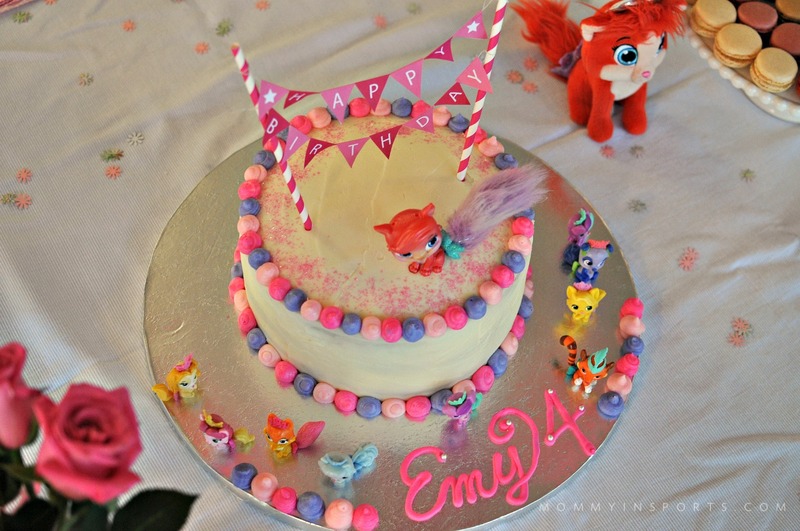 So here’s what I decided to do to create my own simple homemade Palace Pets birthday cake. First things first you need an amazing recipe, and I stumbled upon the best white cake recipe ever. 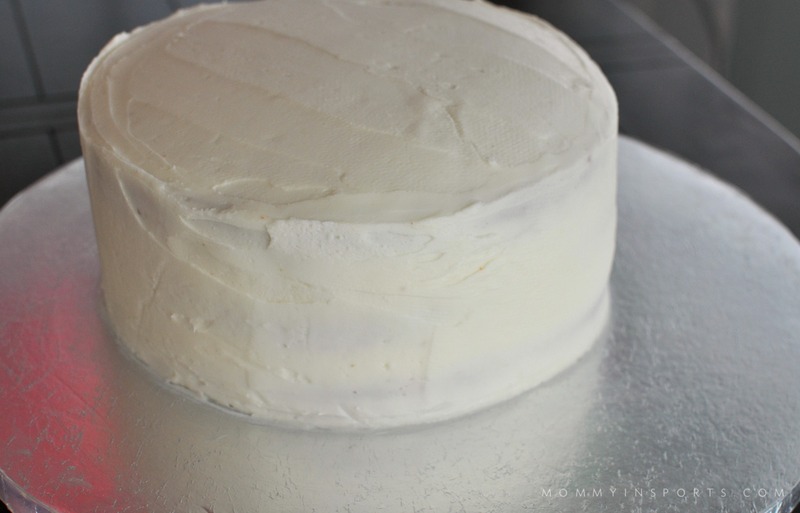 Seriously, the silkiest and moistest cake I’ve ever made, and it’s the perfect measurements for a three layer ombre cake. 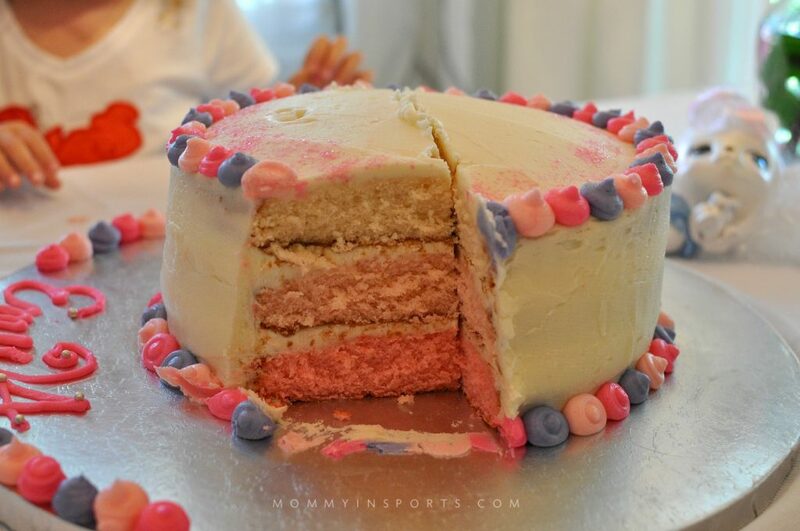 Not sure how to do an ombre cake on the inside? 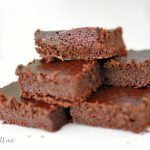 Seriously easy, just measure out your batter in three bowls like I did for this cake, and then tint it however you like. 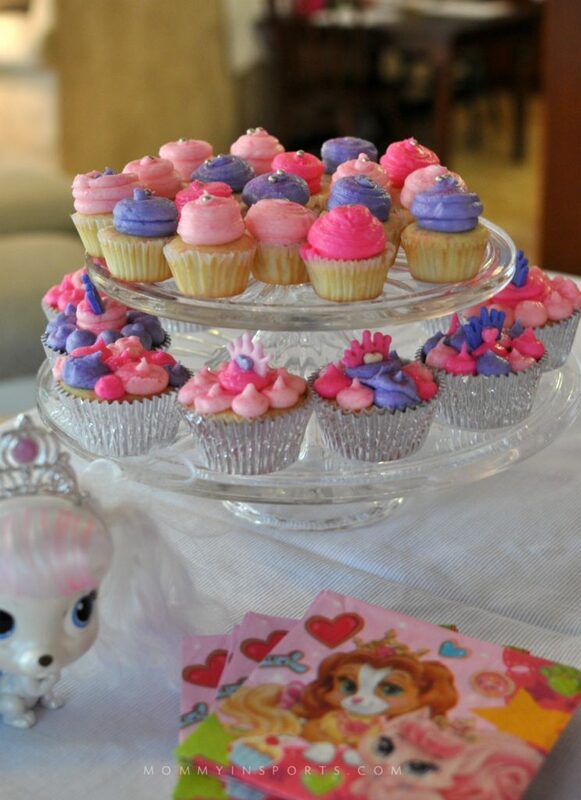 I used pink gel color by Wilton and just slightly varied it for my pink-tastic Palace Pets princess! But we’re getting ahead of ourselves. Once you bake your cake, freeze it. Yes you heard me right. Who has time to bake a cake when you’re throwing a party?! Do it ahead of time, like the weekend before, then wrap in cling wrap and freeze. 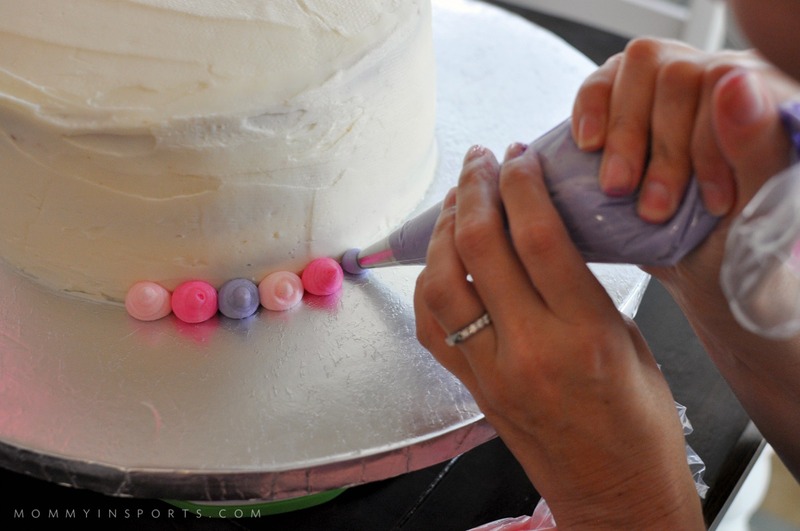 Then crumb coat it while frozen the day before your party, so easy! See how messy my frosting is? It doesn’t matter! 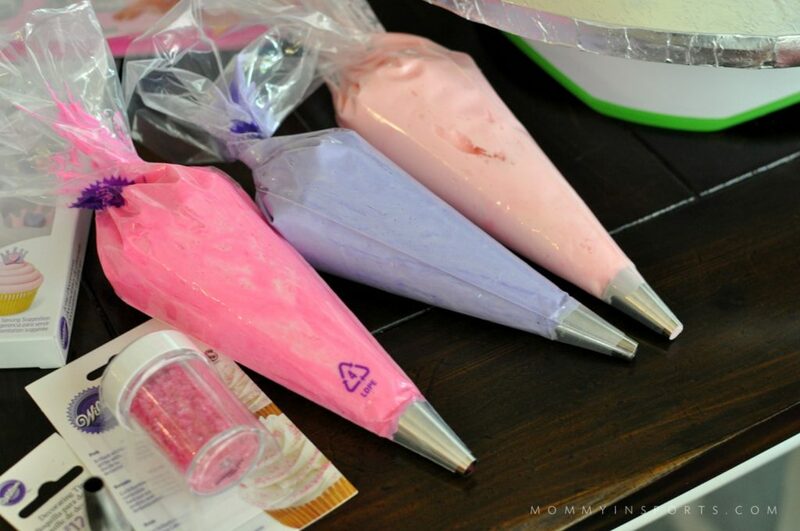 Yes I want one of these frosting smoother tools, but whatever! I made a double recipe of the buttercream, and didn’t quite use it all for the cake. So I saved the rest and made a single recipe for this. I used pink, purple and rose gel colors by Wilton. (Or this set would get you close!) 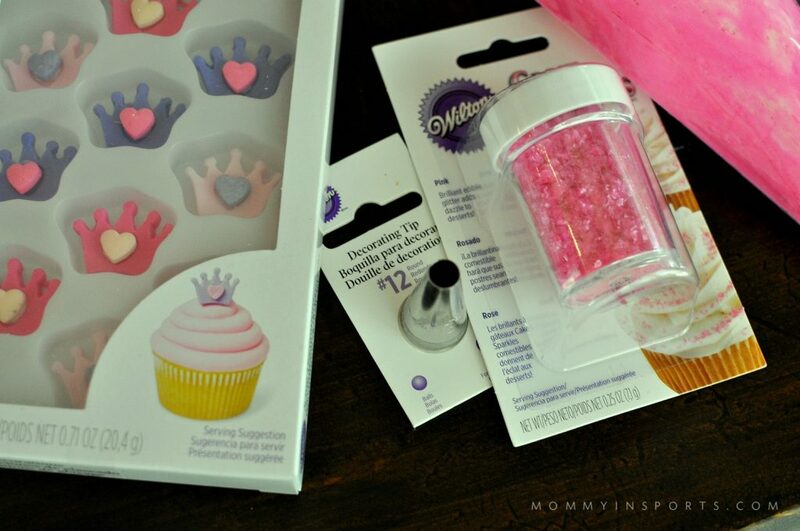 And three 12 tips by Wilton I picked up at Michael’s for $1 a piece, plus this sanding sugar to top the cake. Then it’s time to do your dots. No, I’ve never done this before, but after just a few I knew this was going to be a piece of cake! (see what I did there?) 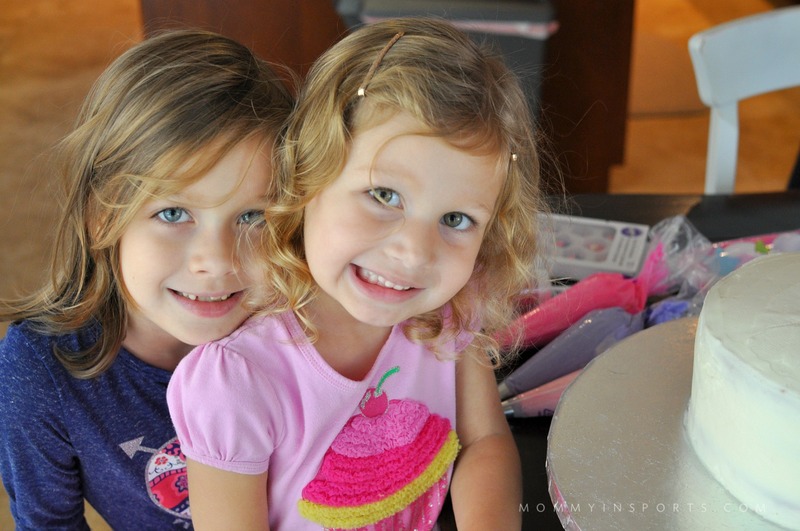 So simple, I let the threenager and my other baking assistant do some! Then with the remaining frosting, we did the same dot technique on some cupcakes I had previously baked and frozen like a month ago for a school party. 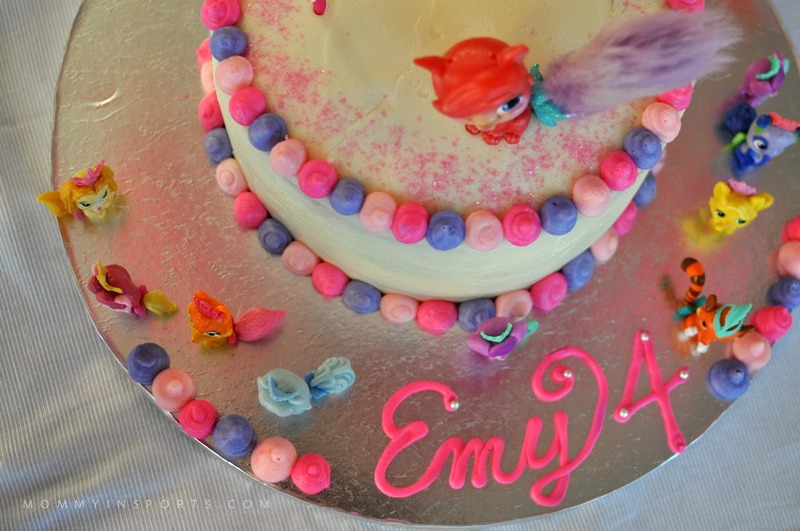 Lastly, we topped the cake off with some sanding sugar, Emy’s name on the base, and of course mucho Palace Pets figurines! FYI…it only took me 6 times to write her name in cursive. I kept writing E N Y instead of the 3 hump cursive M. Sigh. Oh yeah, I almost forgot, we printed out this bunting from this website, and my husband assembled it for me using dental floss and straws. We’re fancy like that! 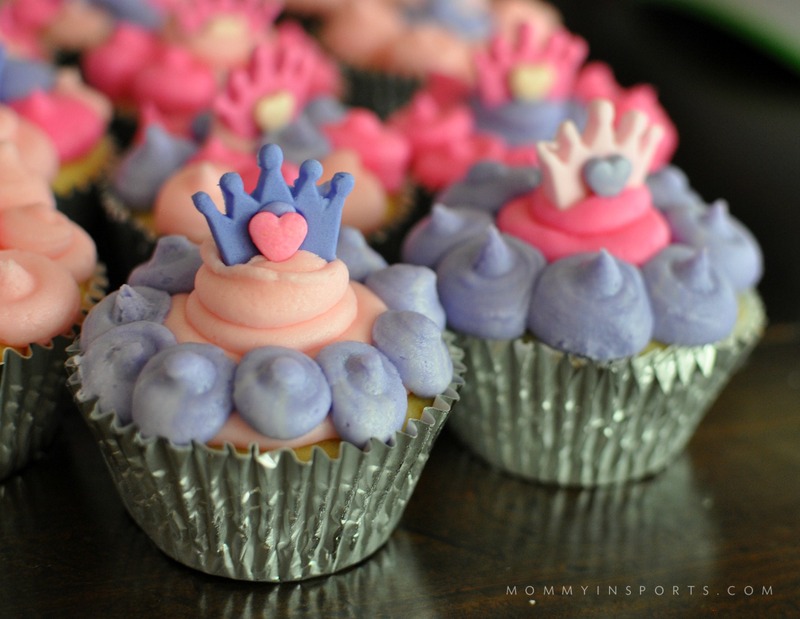 We let the girls go to town adding crowns, silver pearls, and the whole bottle of sanding sugar to the cupcakes! 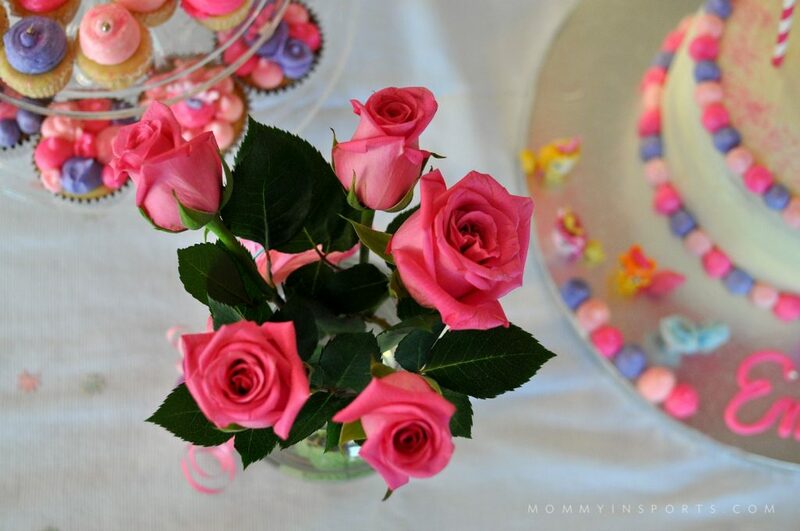 and pretty pink roses for our nearly four year old. It’s safe to say, despite torrential rain and tornado warnings that nearly blew away our bounce house, it was indeed a happy birthday! As for the cake, this really is easier than you think. The reason I do these tutorials is A) I freaking amaze myself that I pull them off, and B) to encourage and inspire others to try to bake your cakes. It’s so much fun to do with your kids, and saves you bucko bucks. 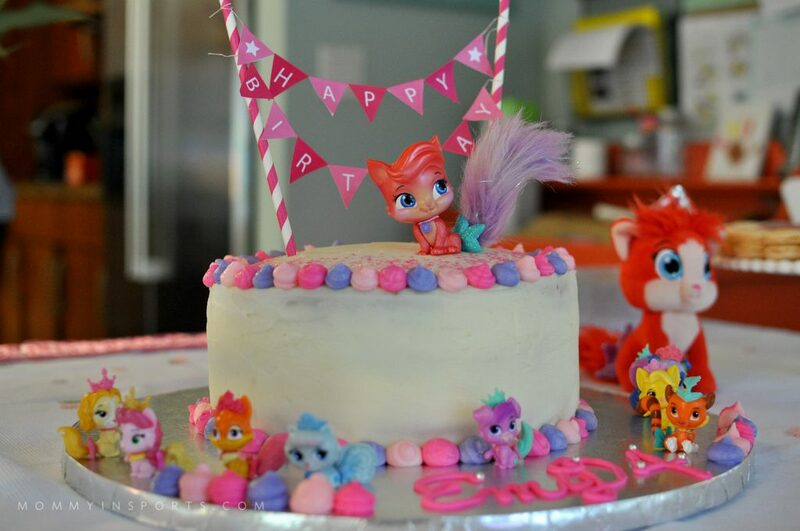 Plus the memories she’ll have making cakes with her mom is something I hope she’ll treasure as much as her beloved Palace Pets friend. Good luck cake making! 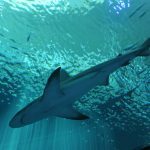 Please pin this for later too! 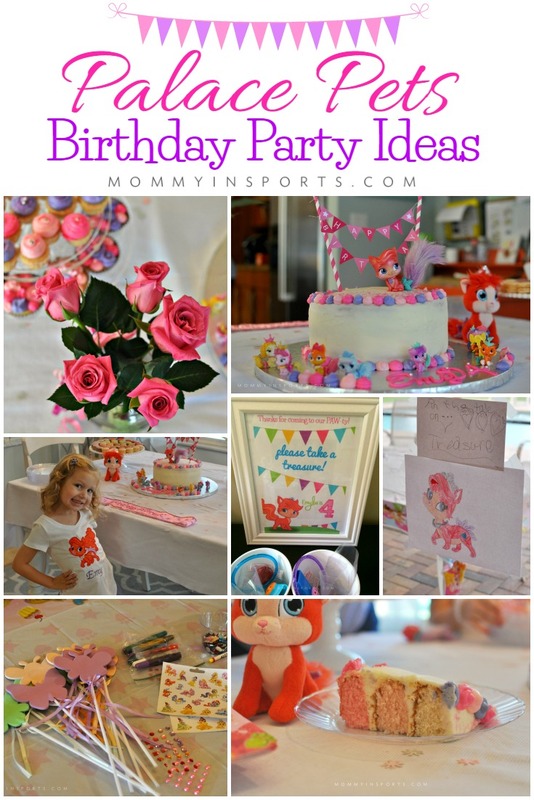 Oh and if you need more birthday party ideas, check out my Palace Pets Birthday party post! 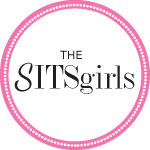 I also wrote a gift guide, yes there are tons of gift ideas out there too! will you try your hand at baking your next birthday cake? Thank you, I’ll save you a slice! ha ha! Looks awesome! And she looks so happy…and big! Thanks! She was so happy, that’s all that matters! What a beautiful cake!!! 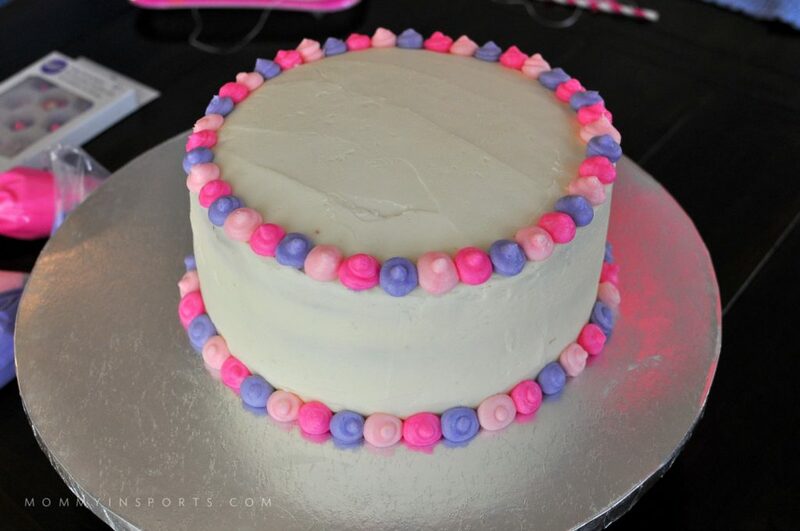 I’m inspired to attempt a cake like this now! Thank you Kara, it’s SUPER easy! It’s the love baked inside! 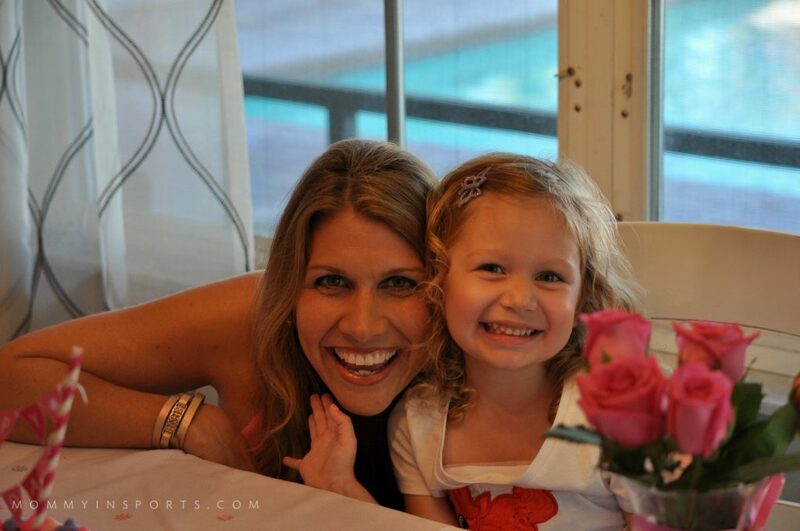 I can’t believe she’s four! Scarlet is the biggest Palace Pets fan too. I’d love to make this cake. And the best part is the toys you get to keep at the end! According to Scarlet, anyway. For me, it’s those macarons. WHOA. 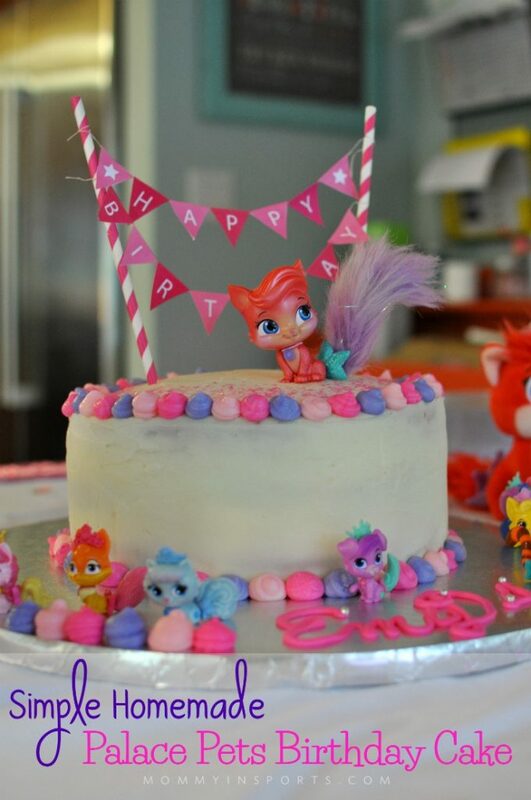 Super cute cake! The cupcakes too! You looked delicious! So cute! You did such a good job. I think it’s fun to make our own cakes too. I love your idea to make the cake ahead of time. Much less stressful! The cake turned out beautiful! Loved the different colored layers. And my mind is blown at Sam’s Club macaroons. I had no idea. Thank you! This turned out so cute! I knew you could do it! Pinned, tweeted and stumbled for all to see! 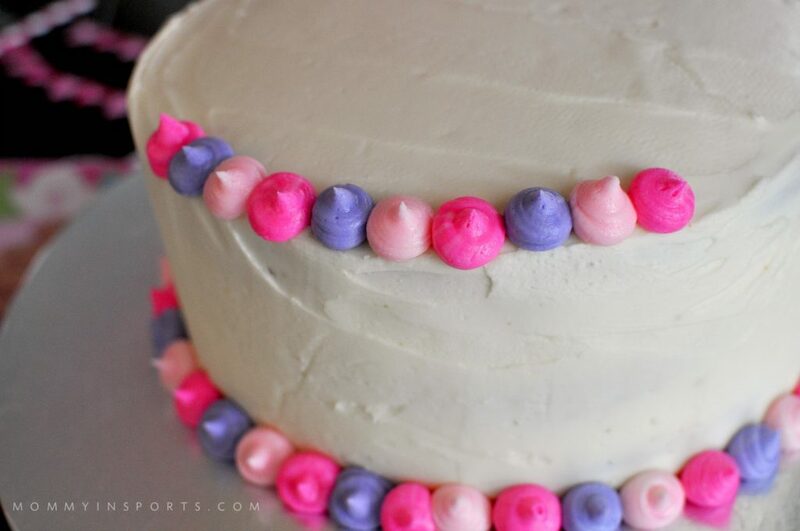 You make it look so easy to make such a gorgeous cake! 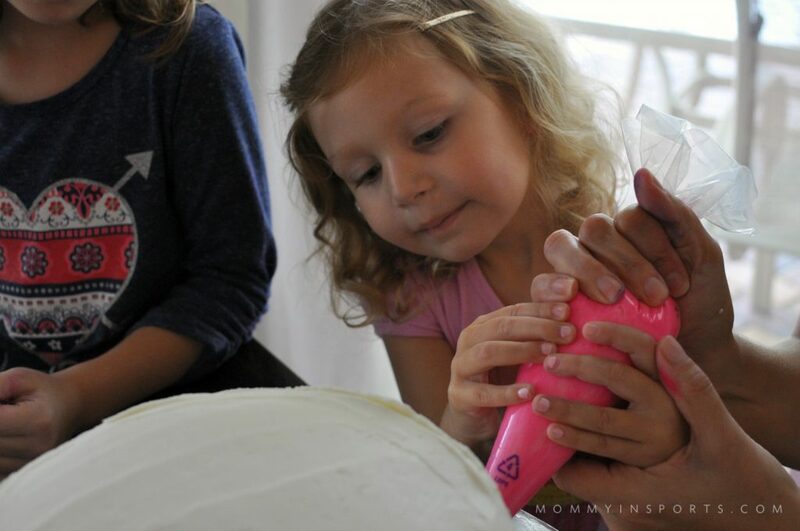 I can’t imagine ever making my own birthday cake – I leave that to the pros! Please try it! Just once when you don’t have a party coming, you might surprise yourself! oooh fun New Years party! You can buy macaroons like that from Sam’s Club!! Why have I never seen these?? What a beautiful cake, I am a really crappy cake decorater, so can I just pay you to make one for me next year? 🙂 Give your girl a big Birthday hug for me! 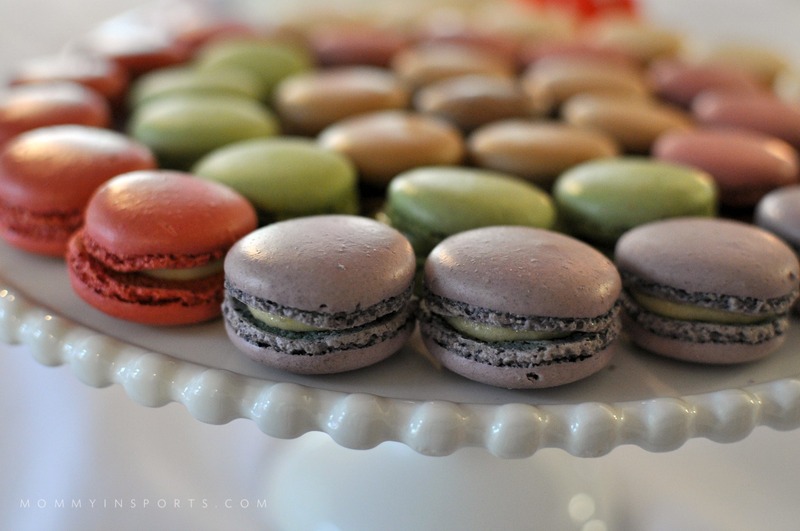 Yes, I JUST found the macaroons this week, SO GOOD! Thank you and Happy Thanksgiving to you! What a cute cake! 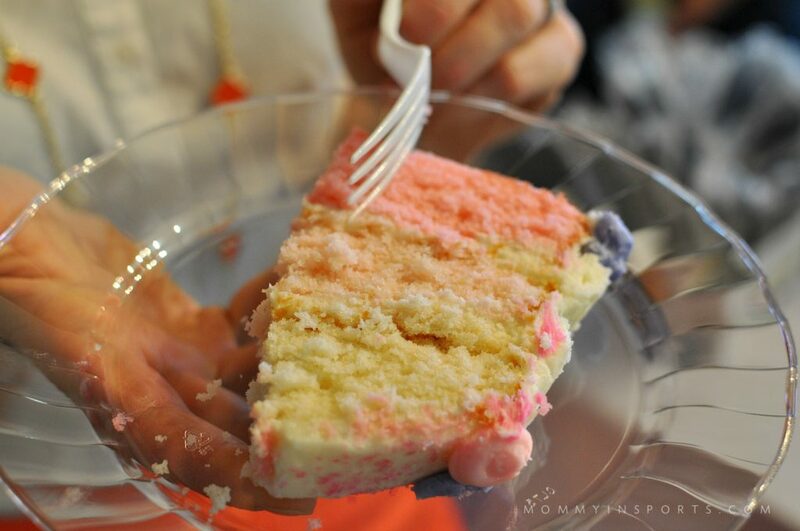 Great advice to freeze the cake before crumb coating it, and I love the big impact of something as simple as multicolored dots. What a lucky birthday girl! Ahhh, this is TOO CUTE!! !